Easy to grow Color of Bloom: Yellow, Months of Bloom: April Hardy Zones 5-7, Mature Height: 18-30" Immediate shipping The plant you will receive is growing in a 4" pot. 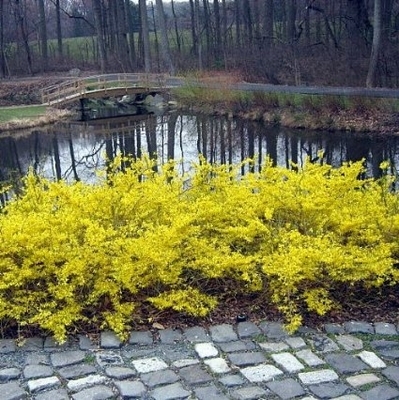 is a compact shrub that has an abundance of bright lemon-yellow flowers blooming in early spring, creating quite the color show when mass planted. You need to prune immediately after spring flowering. Gold Tide is easily grown in average, medium, well-drained soils, in full sun to part shade, but the best flower production is in full sun. With its compact-spreading shape, it typically grows to only 20" tall but spreading to as much as 4' wide. Group them in borders, foundations or on banks or slopes. They do well on sunny areas of open woodland gardens. Hardy in Zones 4-8.